A single tracking shot, sparkling choreography, and some blue sequins turned a modest indie heroine into a household name -- we get Leslie Feist's digits during the busiest week of her life. One of Feist’s backup singers, Mary, is crying. Another, Diane, holds an ice pack to her own bruised and swollen hand. At first glance, it would seem as though things backstage at Saturday Night Live’s NBC studio have gone horribly wrong for tonight’s musical guest, when in fact the opposite is true. Soon, the 31-year-old Canadian singer/songwriter will wind down her second performance of the evening, the trembling rock song “I Feel It All,” and a small crowd, which includes several black-clad choir members from the first number (“1234″), has already gathered in the hallway near the studio’s entrance to congratulate her. The tears, it turns out, are happy ones, and the hand injury — well, blame it on some very vigorous backup clapping. She’s referring largely to the moment in September when her bittersweet but uplifting single “1234” and its accompanying thrift-store Busby Berkeley video made the leap from YouTube curiosity to pop-cultural touchstone, courtesy of whoever picks songs for iPod commercials. 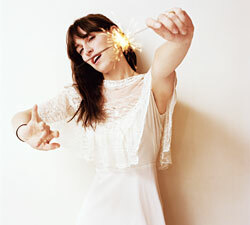 Before then, Feist had been playing music for almost half her life without ever approaching this kind of success. (The Reminder has already moved 350,000 copies, more than double her previous album, 2004’s Let It Die.) But for this erstwhile member of Broken Social Scene, the corporate-wary Toronto collective that behaves more like a loose-knit family, a licensing deal can be a little stigmatizing. Hand-wringing aside, it’s hard to argue against anything that promotes the video’s three minutes and 22 seconds of sheer bonhomie: Feist, looking like a movie star (or maybe just a hot bartender) in a blue-sequined jumpsuit, twirls, claps, crowd surfs, and forms kaleidoscope swirls with a few dozen of her colorfully dressed, carefully choreographed friends to a chorus of ba-da-ba-da-das. The whole thing seems totally spontaneous, thanks to director Patrick Daughters, who masterfully captured it in one uninterrupted shot. Studio 8H at NBC headquarters in Rockefeller Plaza doesn’t seem any closer to reality than a Parisian manor. Backstage at SNL, the show’s host, news anchor Brian Williams, eagerly poses alongside Feist for a photo (she was his personal choice for musical guest after Bruce Springsteen couldn’t make it). As Williams rushes off to a skit, Superbad star and fellow Canadian Michael Cera, who dropped by for a visit and has been timidly leaning against the Weekend Update desk, wanders over to introduce himself. If there was any suspicion that fame might have changed either of these newly minted stars, their animated discussion about Ontario’s highway system dispels it: They are just as awkward and prone to small talk as anybody else.